Scientists at the UF/IFAS North Florida Research and Education Center, particularly its Marianna facility, may take a while to fully recover their research after it was damaged by Hurricane Michael, University of Florida Institute of Food and Agricultural Sciences administrators say. In Marianna, five center pivot irrigation systems were turned over and damaged, said Glen Aiken, director of the UF/IFAS North Florida REC. The center’s perimeter fence took hits from falling trees and limbs. Buildings at Marianna sustained damage to roofs, siding and doors. 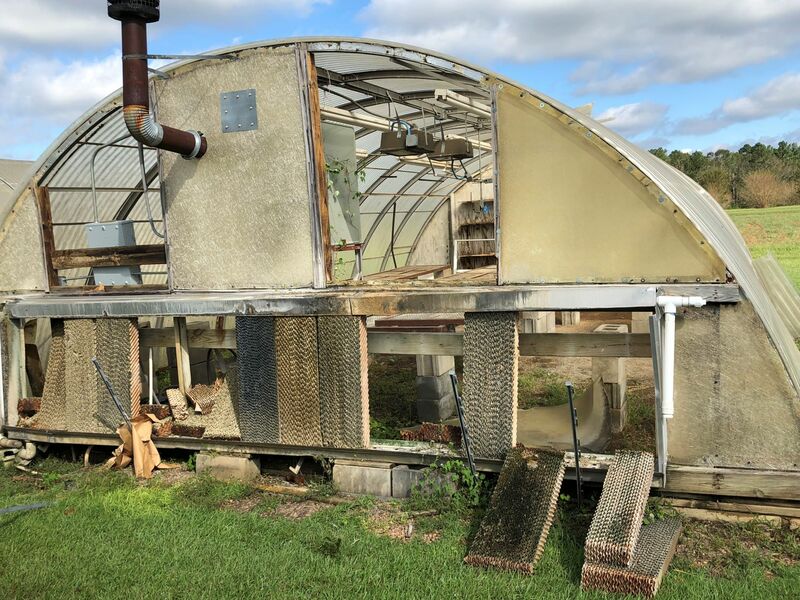 The Florida Foundation Seed Producers (FFSP), adjacent to the main Marianna operation, suffered extensive damage to its peanut facility, which stores peanuts. After the storm, FFSP moved out hundreds of tons of seed peanuts to preserve their quality, said Jerry Fankhauser, assistant director of the Florida Agricultural Experiment Station, also part of UF/IFAS. At the Beef Unit and overall animal operation at Marianna, miles of electric fencing fell victim to numerous trees blown down on them, which makes it tough to keep the cows in their pastures, Fankhauser said. The bull test station is also challenged because the bulls can’t be put back into their designated paddocks. These losses likely will impact current and future field research, in addition to planned research efforts in early 2019, Fankhauser and Aiken said. “The losses to field research were substantial, which is the greatest nightmare of any faculty member — loss of data,” Aiken said. Aiken said he hopes to meet with center faculty Thursday or Friday to get a full report on the damage to each of their research projects. “Growing seasons are messed up for everybody,” Aiken said. NFREC’s Quincy facility also sustained damage to greenhouses and a shed in addition to tree limbs on the ground, Aiken said. Aiken credits his faculty and staff for coming through a rough situation with their heads held high. After NFREC staff got past its personal hardships, employees did their part to return the center to a sense of normalcy. Then farm crews from other UF/IFAS research centers answered the call, Aiken said. Five staff members from the farm crew at the UF/IFAS West Florida REC in Jay, Florida, helped clear trees from fence lines and replaced fences that were destroyed. Two farm crew members from the Range Cattle Research and Education Center in Ona, Florida, helped replace fences. In addition, the North Florida REC-Suwannee Valley provided labor and equipment. 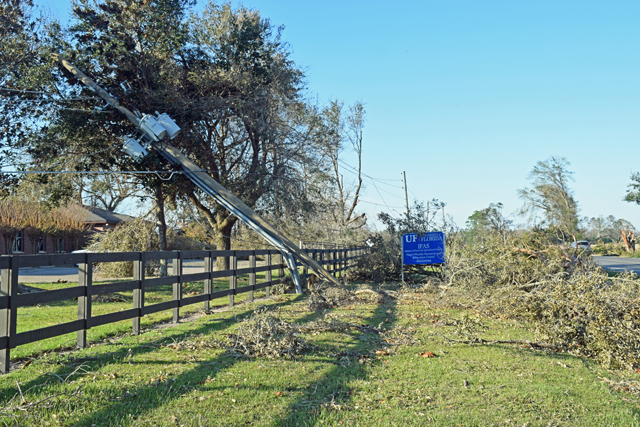 Electricians and others from the Plant Science Research and Education Unit in Citra and the UF campus in Gainesville have helped get generator power and assisted with overall cleanup. Aiken gave particular credit to Barry Tillman, professor and associate director of the NFREC Marianna office. He said Tillman: “provided very strong leadership to his staff in their on-going clean-up efforts. His observations and advice have been extremely valuable.” Recovery will take a long time, Aiken said. “There is considerable repair and clean up that may take weeks,” he said.